Mayra Barraza, 'Little Man' from the 'Invisible Man' series, oil on canvas, 20 x 20'. Mayra Barraza paints ghosts. Spectral faces on white canvases struggle to make an appearance, glimmering through a haze but never quite coming into being. Once they were people, men with lives, with families and identities. But they got lost, disappeared into the history of violence that defines the beleaguered nation of El Salvador. Driven by a cultural machismo, men disappear into this maw of inchoate rage and are lost. However global her recognition, Barraza remains an artist of her native country, which is still recovering from a twelve-year civil war that concluded in 1992. Violence, once learned, does not simply vanish, and like many artists from the region, Barraza examines the impulses of destruction that have permeated the social fabric. Barraza presents here the series “Invisible Men,” which recalls Ralph Ellison’s characterization of the forgotten people in a negligent society. Barraza began her portraits of “Invisible Men” by isolating tiny ID photos of individuals who were casualties in the Iraq War. Tiny portraits floating on a field of unprimed canvas remind the viewer that El Salvador is the only Latin American nation to fully participate in the Iraq War. Part of the “coalition of the willing,” these soldiers fight and die in an American colonial war, presumably for the sake of El Salvadorian immigrants in America. At least these Iraq casualties had names and faces. Barraza’s subsequent paintings develop the theme of invisibility further. What the spectator sees are not men but traces of masculinity. Barraza’s paintings of these nameless men are mid-sized, but the hovering faces in the process of un-becoming are life-sized. Confronting the viewer pitilessly, some of the faces are further obscured by the soft painting. The grays and browns wash away life, leaving behind only echoes of loss. Other faces, at once individual and universal, appear intact, buoyed by areas of color. Some wear shirts that are vaguely reminiscent of sports attire. A few wear phallic like caps or appendages on their heads. 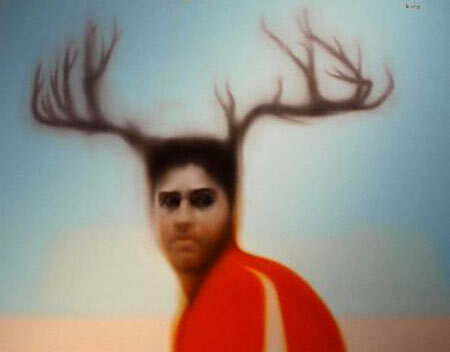 And even more pointedly, one of the men, wearing a bright red shirt, is crowned by a full set of antlers. Some men have strange and unaccountable bars riding in front of their eyes, preventing us from identifying them. Another man, someone we might know, stares out at us with eyes already darkening. These recent paintings by Barraza attempt to locate nameless men who have unaccountably disappeared into the violent dis-ease that cripples a nation struggling to recover from a toxic legacy. Without knowing the history of El Salvador, the viewer understands that something terrible is happening to these men. We do not know from the images themselves if the men are victims or perpetrators. There are faces of men who have killed and of men who will die, swallowed up by forces beyond their control. Here and there glimmers of color struggle to emerge, but the viewer knows ultimately the men will become invisible. All one can do is to helplessly watch the disappearance into a great white blankness.